Give yourself a bit of retail therapy at Market Square Kauppatori and OMA Puoti. We've included these beaches for you: Bellevue Beach and Beach Mansikkalahti. Venture out of the city with trips to Nuuksio National Park (in Espoo), Fagervik Museum (in Inkoo) and Kotka (Riverside Park & Linden Esplanade). Spend the 29th (Tue) exploring nature at Teijo national park. 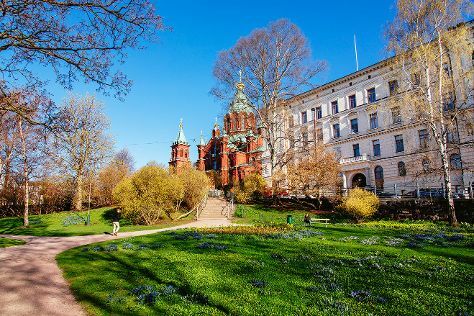 Next up on the itinerary: learn about all things military at Sea Fortress Suomenlinna, take in the spiritual surroundings of Uspenskin Cathedral (Uspenskin Katedraali), look for all kinds of wild species at Arboretum Mustila, and admire the striking features of Rock Church. To see maps, reviews, more things to do, and tourist information, read Helsinki trip planner . If you are flying in from France, the closest major airport is Helsinki Vantaa Airport. October in Helsinki sees daily highs of 10°C and lows of 1°C at night. Finish your sightseeing early on the 31st (Thu) to allow enough time to travel back home.